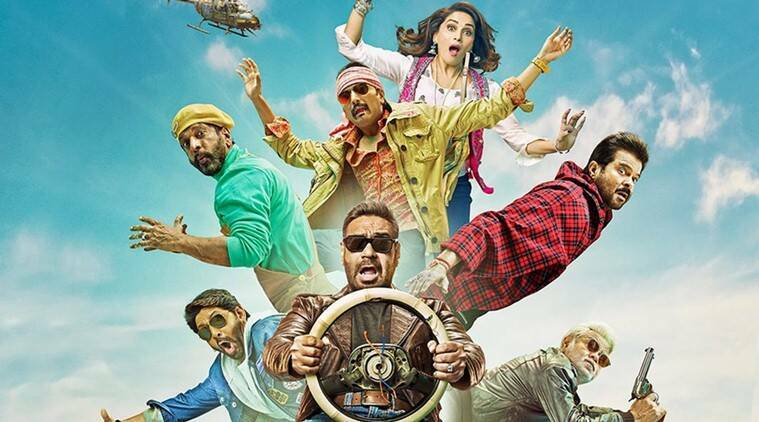 Total Dhamaal movie review: The only people who prevent you from strangling yourself is the forever-bickering couple played by Anil Kapoor and Madhuri Dixit. Total Dhamaal movie review: In the film, the CGI animals have more effect than the humans. As I was about to leave for the theatre, brain shrewdly asked: do you need me along? That was a nudge, which got me to say, no, not really, why don’t you rest up a bit. How many men do you require to change a light bulb? Indra Kumar’s return to his Dhamaal franchise with a third instalment rejigs this old joke. How many actors do you require to make fools of themselves in order to grab a jackpot? Most of the faces are familiar. Ajay Devgn brings his slo-mo stride to the plot. Err, what’s that? Total Dhamaal is nothing but a string of random sequences, shot in water and on land, desert and sky. Sanjay Mishra keeps saying ‘bro’: he doesn’t, in my hearing, say ‘yo’. Boman Irani vamps it up, in a sharp little moustache. Arshad Warsi and Jaaved Jafferi twin, inhabit mostly flatness, making me wish for the hundredth time that these two sharp comic talents get a movie which gives them something, anything, to do, other than being chased by computer-generated vultures (yes, this happens). Brainless comedies can be a lot of fun (brain, stop smirking), but they need to be written with smarts. Here, the CGI animals (the climactic chunk of the film is set in a zoo) have more effect than the humans. A rhino’s horn becomes a pointed spear for falling backsides. A chimp and an elephant are used to give us lessons on kindness. And a roaring tiger becomes the emblem of Gujju pride, with a character saying: a Gandhi chased the Brits away, and the one we have now will conquer all. Clap clap. Pandering to the powers that be? Oh, fully. Meanwhile, the tasteless jibes against women, a trademark of the Dhamaal franchise, pile up: ‘kaamwaali bais’ are fine, wink wink, wives are of no use, girls are ‘paisa udaane waali cheez’. Folk from the South of India are dark, wear dhotis, and speak gibberish. Racism, much? About the only people who prevent you from strangling yourself is the forever-bickering couple played by Anil Kapoor (motabhai, husband) and Madhuri Dixit ( Marathi mulgi, wife). They have an easiness between them which comes of long years of working together, and watching Dixit, unburdened from the weight of looking glamorous, reminds you of the powerhouse she used to be. These two deserve a film of their own. And Ms Dixit can also do a mean thumka, still.